When you’re looking to make changes in the bathroom, it’s understandable that certain things will take precedence. The shower and bath are often the first on the list as providers of daily comfort, followed by the toilet and sink. Even the tiles get a lot of attention as the background for the room’s style, but many people still overlook the towel situation. The simple reason is that they come and go and generally do their job and just get stored on a simple rail. However, some decorators prefer to leave some room in that renovation budget to do the humble towel a favour and provide a towel radiator. This simple upgrade can not only improve your comfort, but also turn a plain old necessity into something functional. A good towel heater can even contribute towards heating the room, as well as making towels more cosy and pleasant in the winter months. The fact is that they don’t have to be expensive, either, if you shop around online for cheaper models from specialist manufacturers. 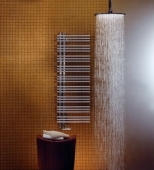 There are a few types of towel heater that you should know about before purchasing anything. These vary in both price and the way that they’re installed, so they can affect your budget and the way you go about your renovations. See if any of these spark some design ideas. Electrical. Some heaters are electrically powered, which means they need a power source such as a socket or hard wiring. These are usually freestanding and you can reposition them with ease. Hydronic. 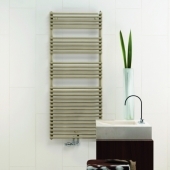 The other main type of heater is hydronic, heated by warm water, like a standard radiator. These therefore need to be plumbed into the house and can be tricky to install. Floor mounted. These models stand on the floor but are bolted in place, as they need a direct connection to your water pipes. Wall mounted. This variation mounts the heater on the wall, usually vertically. These save space and look fantastic, provided your pipes reach. Extras. Note that some radiators include extra features like hooks for dressing gowns or thermostats to keep the temperature in control, or even timer switches. Consider the above when you pick your new towel radiator. As with most of the fixtures in your bathroom, functionality is just as important as form, though of course searching for the most appealing model is the fun part. Remember to ensure that the style you choose matches the other furnishings in the room. Once you decide on the type you want, you can start looking at the top brands and individual models. You might be surprised what’s in store on the internet, where you can buy heaters from reputable brands with considerable discounts. Keep in mind the differences in cost and installation between electric and water heaters, plus wall and floor mounting. Many manufacturers have multiple types within one range, so have a look around and see what matches your design scheme. Two of the main bath room producers to start with are Zehnder and Kermi, then you can expand your search from there. Zehnder have the popular Charleston range which features a mixture of designer heaters, like the design-HK which is a wall mounted radiator with a simple towel rail. Look out for the Charleston models with a central full length mirror, a great space-saving idea. The Zehnder Yucca Mirror series also has mounted mirrors but in a much more contemporary asymmetrical form, with radiator tines pointing sideways from an offset mirror. 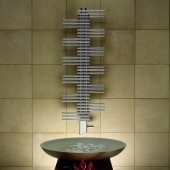 Zehnder Yucca’s standard line has the same comb-like design with plenty of room to hang towels. For an electrical option, try Zehnder Nobis for a very simple, almost deco style. Meanwhile, Kermi’s towel radiators include some bolder designs for more colourful rooms. Try Kermi Ideo for a spiky, modern art feel. These are just a few examples that might inspire your search. Though they may seem like an unnecessary extra, you won’t know how you did without these luxurious inventions! Just imagine climbing out of the bath and knowing that thanks to your new bath towel heater, you can be instantly toasty warm. Pick one that suits your bathroom needs and design and you’ll never look back.